clay and limestone: Through the Garden Gate, Ahem, I mean Patio Door! Through the Garden Gate, Ahem, I mean Patio Door! As you know we rarely enter the garden through the gates! You don't want to go beyond the fencing...there be dragons and such to scare you! The consequences of 8 inches of rain in a few weeks have left the soil unworkable. It will take weeks to dry out. It is what it is! Clay and limestone! My plan is to remove the pinestraw, dig out the invasives and cover with compost...then reapply the straw. It's a battle I fight often! Meanwhile back to the tour! This morning the garden was chilly...43 degrees and breath condensation was noticeable. My fingers were cold without gloves...let me tell you my dear northern friends...this is very unusual weather for a Middle South garden. Usually we are knee deep in bugs and humidity! Not to worry in a few days it will be back to normal. The sun has shifted in the sky and lights up the very green and fast growing lawn! the Rainbow Swiss Chard in front of it looks pretty in the morning sunshine. that blooms in the semi-shade much better then I thought. It would be magnificent in a sunnier spot. Those are a premium here! Maybe I am in denial, but sun lovers have been planted here! Many of them are early bloomers and have already had their moment in the sun! A few like Echinacea purpurea will bloom nicely in a semi sunny spot. The sun gently lights up the Nassella tenuissima. the Garden of Benign Neglect was in full sun. here is the magnificent Sun shining on the back garden this morning! What is going on you wonder! The house is being pressure washed and painted...which is my excuse for being so slow with my post! I hope you all had a good weekend and had enough time in your gardens. I love those funky bird houses. Too cute. That photo of the group of then looks just like an art composition waiting to be made. I'm very happy to see the sun again, but there has been too much rain. You've got some hard work ahead with shaping your soil back and drying out all that rain! But everything else looks so beautiful, sunny, and a wonderful view! Sure was a cold morning! It's still a little chilly outside. 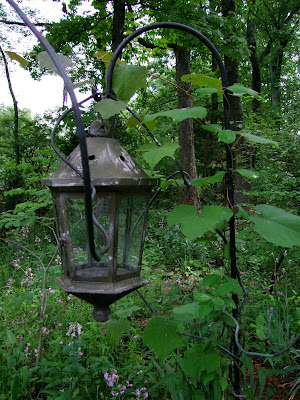 I like that old lantern you have, where did you find it? Girl it's cold here too! One inch and 7/10's of rain yesterday and it's not getting out of the 60's today, you are right it will be hot and humid again very soon. Lovely tour of your gardens! Gail, that was a lovely walk around your garden. I even wore my rubber boots, so I could step off the paths without worrying, sorry for compacting your soil. All that greenery behind the stone walls looks fabulous. Your new plants look like they are settling in well, and of course, the old favourites look sweet too, "Hi phlox." Hi Gail, so much going on in your garden. I love the sweetspire! Everything looks so nice. I love pinestraw as mulch; it keeps out weeds better than any wood mulch. It's not sold here up north, but my mom rakes up bags & bags of it from her pines and saves it for me. Yay! My rainbow swiss chard has not sprouted yet, but I'm looking forward to it. P.S. We not be afeared of dragons! I don't blame you for trying some sun-loving plants in the semi-shade; we have to work with what we have, and hopefully they will adapt. Miss PPPP, though, seems perfectly happy anywhere. Gail, what a lovely, lovely tour! I enjoy the cool weather, but I know your kind is not long away. I have a question I hope you can answer. Last night we returned from a few days in the Nashville area. Driving through some new highway cuts through the limestone, I could see a wild sedum growing on top of the stone and it was flowering away and is pink. It is blooming pink right now. Are you familiar with it? Do you know what it is? I tried Google search for Tennessee native plants, sedum. The hits were for a white sedum, but this was definitely pink and I saw it several times. My grandson showed me photos in his camera and asked me if I knew what it is. He had seen it along hiking trails. All I could tell him was: some kind of sedum. Gail, Love the garden, very lush and green. I think you will have a lot of the Mexican Feathergrass here soon! The first one or two years it was tame...then pow! I have little ones all over the place. Easy to share though! Your iris looks similar to one I have. Lost the name on that one too. Planted some Swiss Chard but got it in too late. Barbee, Hi I do know what it is and isn't it splendid! Sedum pulchellum or Widow's Cross. It loves limestone ledges and will even grow in gravel on a street if the seeds land there. It's a cedar glade annual, but if it likes your garden will reseed itself like crazy and will always return. So far I have had zippo luck getting it to grow here! I keep trying. Dear Gail....the weather here is very dull, windy and we have rain thrown in.....not very summer like yet...I live in hope. Oh I can't wait to see it all! The morning light was irresistable today. Finally no rain and blue skies, even with the cold fingers snapping photos, which look wonderful. You are having so much work done there, are you ever without workmen? Hope your plantings survive that pressure washing. It is a beautiful day, I hope you are enjoying it. Your house will be a totally new house after pressure washing. A big job indeed. Hopefully you guys will dry out soon. No rain expected until Thursday and this low humidity is wonderful! I think you'll have luck with your feather grass. I have a clump and it is in the shade most of the time. It's been there 3-4 years and does okay. Have a great day. I'm inside today. Don't forget-tomorrow is PPS. Not sure if I'll post on it. A wildflower speaker. Thank you, Gail. I will tell my grandson, also. Gail your gardens are gorgeous. All that rain seems to have done something besides being a nuisance. It's finally rained here. We were getting kinda dry. No garden today as it's still misting a little. Boy, did I get a shock when I first opened the door this morning---very cool. Felt luscious to me. Frances, It's been one project after another...the problem started when the birds pecked their way into the attic! Once that was repaired and all the other rotted wood removed...it all had to be painted! Tus the pressure washing mess! Water is a big time issue anyway you look at it! Either we have too much or not enough! Where is the Goldilocks of just right in gardens? Your garden looks great, and probably has benefited from all the rain that we've been having in the Southeastern US. But 8 inches in a few weeks is seriously soggy. Thanks for a nice garden tour. Have the Penstemon and Bee balm. 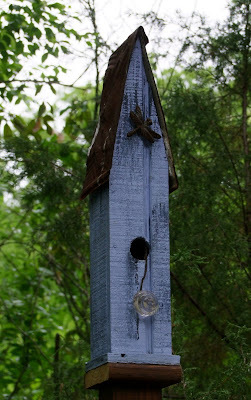 Want the bird house and Irises ! Very pretty yard. Nice to see the wider picture...ya know. Thank you for the tour, Gail. Your Itea is magnificient! Ours was bitten by the below-zero temps we had in Jan, but it's sprouting back out. I am happy to be able to enjoy yours. The other plants are fantastic, too. OH goodie, a pressure wash! How clean and bright it will soon be. You'll have to do a grand re-opening of the new look and invite us for chocolate of course. I promise not to put my fingers on the new paint. That is a lot of rain. I can relate to gooey and icky. I know those two. But you have a big lot and plenty of blooms. It's a lot of work to keep out the plants that love these times of sprouting and spreading. Gail, I am amazed at the GOBN. It loooks so lush and established. The grasses add such a great touch. I grew a Penstemon last year-apple blossom that looks a lot like yours. Aren't they lovely?? I don't know if we've had 8" of rain, but it sure is wet here too. Makes it very difficult to get anything planted. But I remember last year you had such a drought. What is that round stone thingy-love the look. So much to talk about when we meet at Spring Fling! Hi Beckie...The GOBN is lush...the rain has made everything grow like ...weeds! Including the weeds. That is a one of a pair of carved stone caps from a tear down in St Louis~~ I have several pieces of architectural salvage in the garden. I can't wait to get together...not too long from now! Cheryl, I will watch for your post! I wish I could send you the pppp...it's a dream of a plant...still blooming. It was still fragrant on a chilly day! I really enjoyed this morning walk through your garden. Such rain and cold... can only mean sunny days ahead, right? I enjoyed this tour of your garden today! 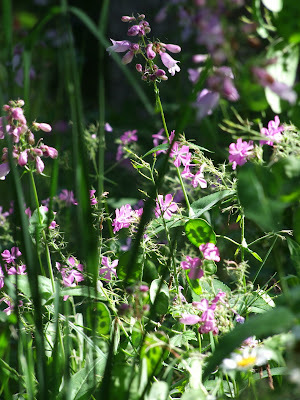 Love the birdhouse collection and the penstemon and phlox section! Gail -- great tour and I'll have to come visit again tomorrow as my eyes are too bleary to see clearly. The Musician and I spent an entire day weeding and mulching, replacing the water feature pump that burned out while we were gone (but it was overdue to burn out). That's what we get for going on vacation (lots of weeds). Thanks for the lovely tour Gail. Such beautiful photos. Gail, your garden seems to be such a lovely place - so many different plants to admire1 And I do love your birdhouses - they're awesome! Gorgeous tour, Gail, and I love your patio and the view from it, too! Strange about that clay, though. When I lived in Nashville, we certainly had limestone, but the soil was a nice, rich loam. It's been raining (and is now freezing---just 37 degrees at 7:30 am) up here, too. The poor container plants and veggies! But of course I'm not looking forward to heat and humidity, either. Where is the happy medium?!! Oh, and how I envy you the pressure wash and new paint! My house needs to be pressure-washed. Well, maybe after things are built outside. Your yard is so enchanting. Looks like a magical place to end or begin the day with a beverage and snack while enjoying the sights. Thank you for the wonderful tour! Even though you have muck, you still have some lovely blooms, and I enjoyed enlarging a couple of the photos. You are unseasonable cool, and here in Nebraska, at 7:43 p.m., it is 84 degrees! Thank you for stopping by my blog. You have a wonderful garden as well as the blog to chronicle it. I'll be back. Everything is coming into play in your garden this spring. Thank you for sharing those pretty button flowers! I can't wait to stop back and see what you will share next! Happy Gardening from my garden in the Midwest. Whether you're walking through the garden gate or through the patio door, the view is as delightful as the gardener. Love the new garden and all else also. Wow, cold for you! Coffee on the terrace? I enjoyed this tour, Gail! The garden is beautiful, I like all the flowers and the birdhouse especially!